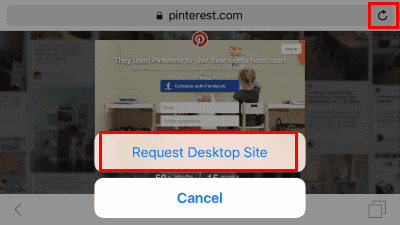 When using the Safari web browser to visit Pinterest on your Apple iPad, iPhone or iPod Touch, you will be shown the mobile version of the site. You can change this and view the full desktop version with these steps. Login to the mobile version of Pinterest using your username and password. Tap the URL in the address bar. The text should become highlighted and your bookmarks will display on the screen. iOS9 and higher users can tap and hold the circle arrow icon at the top right corner of the screen. iOS8 users can tap the URL, then starting from just below the address bar, swipe downward. An option to “Request Desktop Site” will appear. Select it, and you will be taken to the full, desktop version of Pinterest. M hero! 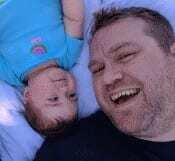 Hate the app and could NOT get to the desktop version. This tip worked when neither iPad blogs nor Pinterest help desk could figure it out, you probably saved my life. An aneurysm was imminent. Thank you for this post. Pinterest was beginning to drive me mad.